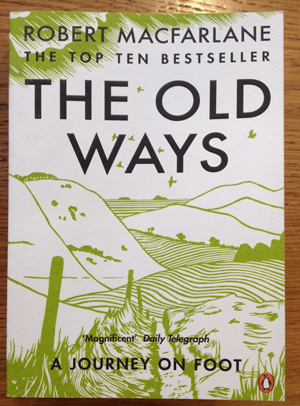 Robert MacFarlane has written a great book which should appeal to anyone engaged with woodlands. 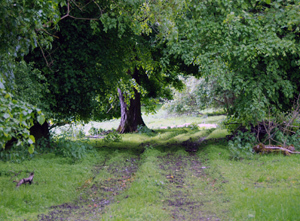 A hundred years ago Edward Thomas wrote, "Much has been written of travel, far less of the road", and MacFarlane has here combined travel writing with route-writing, meandering along woodland paths and taking tracks over fields to explore how and why paths are as they are. There is a powerful section about George Borrow; an extraordinary walker-writer, whose work in the 19th century led to a surge in path following and old way romance: "the breeze on the face, the stars for a ceiling, the fire by the wayside, hedgerow philosophising, open journeyings." "Humans are animals and like all animals we leave tracks as we walk" - but in towns modern asphalt and concrete make our tracks invisible and creation of new routes is decided by government. In contrast, old tracks through woodlands and across fields would have followed "desire lines" as directly as possible to where people wanted to go, whether pilgrims, drovers or ordinary folk wanting to get to the next village. Paths are also consensual - it's hard to create a path on your own. "The Old Ways" is part or a trilogy of such books, complementing "Mountains of the Mind" and "The Wild Places". It's a good thing that MacFarlane's day job teaching and researching at Emmanuel College, Cambridge, leaves him with plenty of time to explore both British woodlands and old rural routes. He also finds time to be the patron of the Outdoor Swimming Society. This is Robert Macfarlane’s best book by far. His passion for walking is obvious on these pages & the paths that he follows are always adventures, always wonder full!